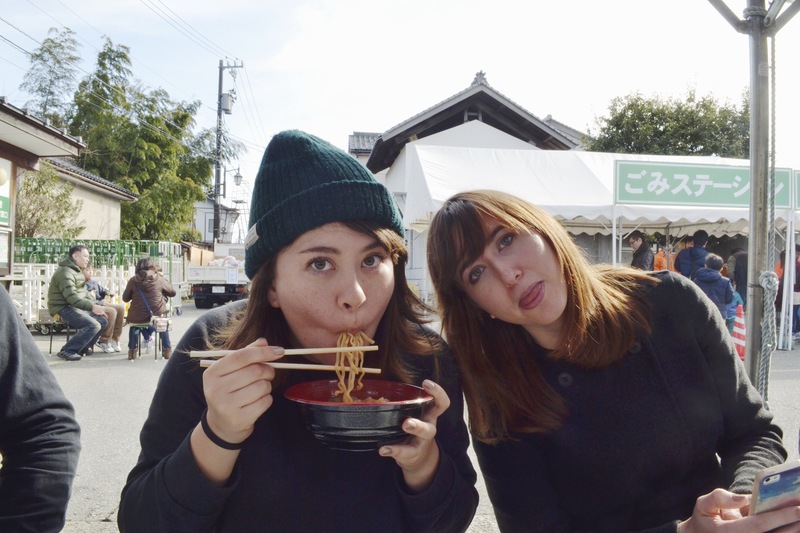 You might remember that I went to a ramen festival last year. I ate a lot of good ramen and I was eager to go again. I actually went both days this year because I am very, very committed to eating. 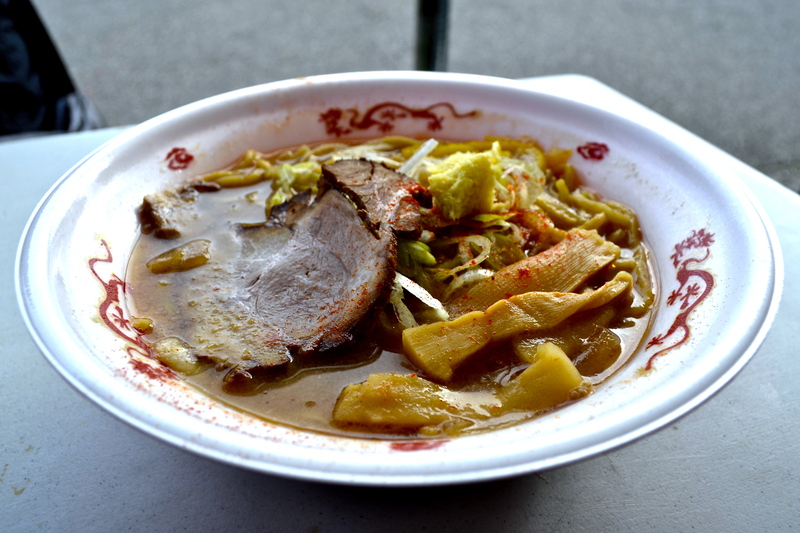 This year I interviewed people about the ramen they were eating and put it all together in one article over at The TRAM. I tried a total of four ramen over these two days. The first day I split a Hokkaido seafood ramen and a green ramen with the friend. 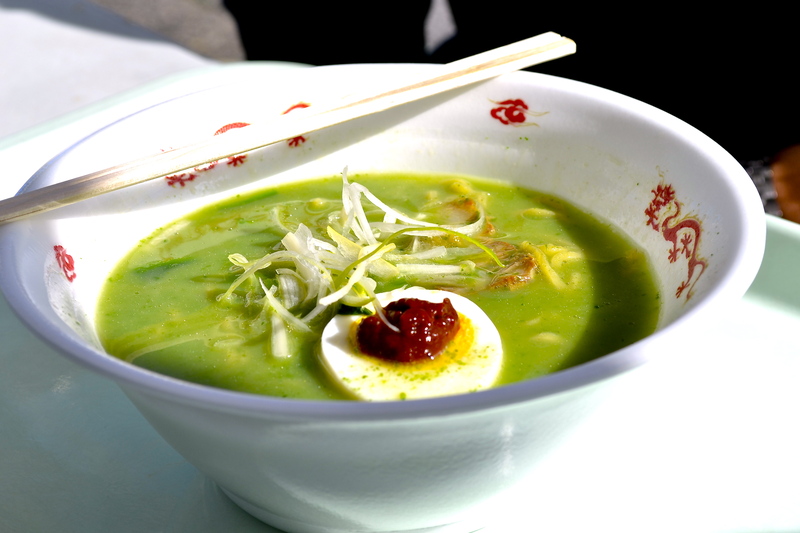 I had the green ramen from Takaoka last year too and I should have remembered that it was good but not mind-blowing. It’s worth trying but I don’t know if I’d go out of my way to get it. The seafood ramen was pretty good, but the broth made me a little sad. I also ate a white ramen from Oyabe which I thoroughly enjoyed. I’ve eaten white ramen before in Toyama, but I didn’t like it. I think the restaurant was running it as a special dish for a few months, which might explain why they didn’t nail it. The one I ate at the festival, however, was realllyy good. 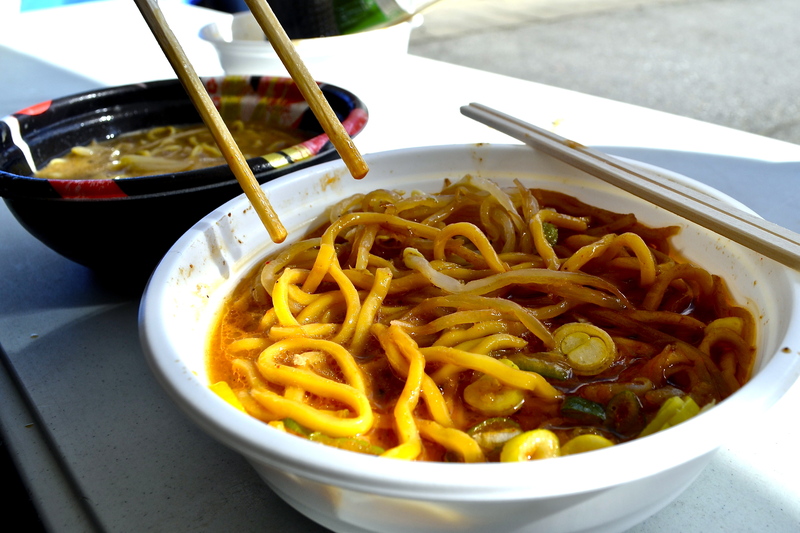 Satisfying, and a little spicy, it was exactly what makes ramen a comfort food. The second day I ate the ramen from Kanazawa which was definitely the best I had! It was meaty and oily and very, very, very unhealthy. I assume that’s why it was so delicious. The meat was almost like bacon instead of the regular chashu that’s served in ramen. It was a little spicy, too. Always a plus. Funny story, my friend asked me to get him an egg since the stall he got his ramen from had none left. When I ordered one ramen with two eggs the guy at the stall was super confused that I would want two eggs. I felt this weird awkward compulsion to explain that “it’s for my friend…ha ha”. lol. After we ate, my friend and I went looking for water. But every vending machine was sold out of anything possibly thirst-quenching. So we went to the nearby convenience store and laughed when we saw that the fridges with drinks were almost completely empty. We ended up buying a large litre bottle of water to share. All in all, it was a successful day. 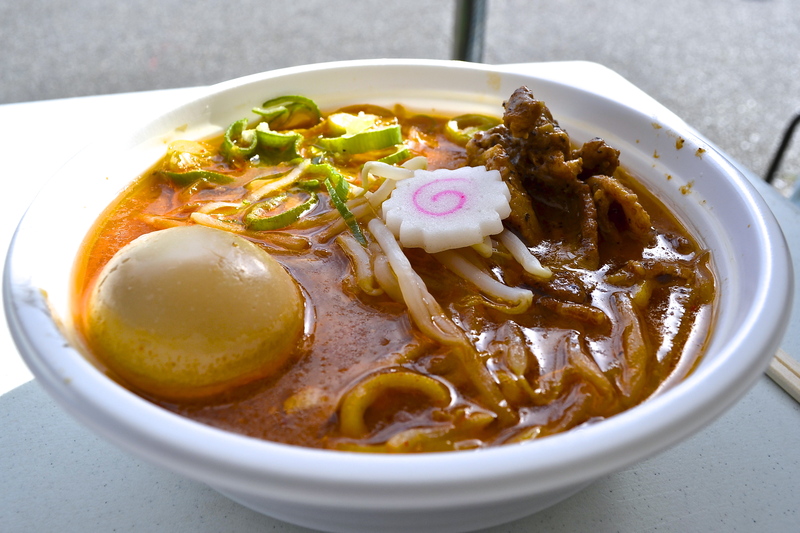 It’s hard not to be content (although very sleepy) after eating ramen as your day’s main activity. 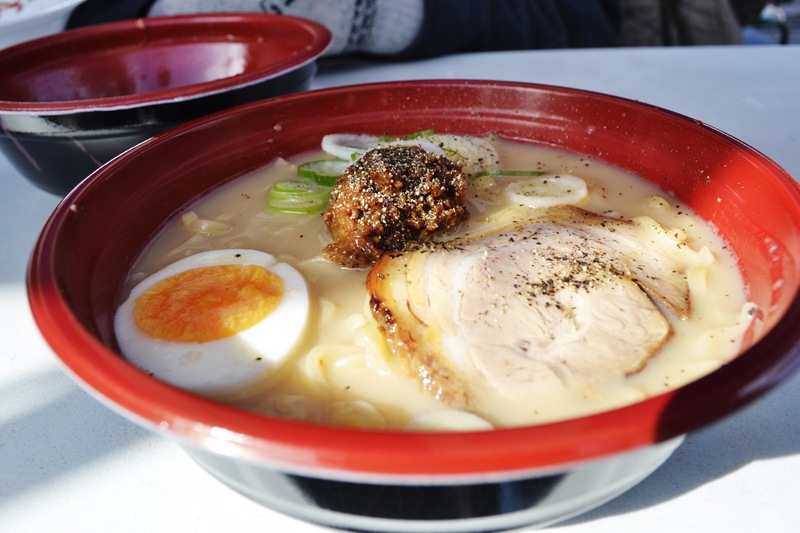 Whenever I go to Oyabe or Kanazawa next, I’m going to try the ramen again! 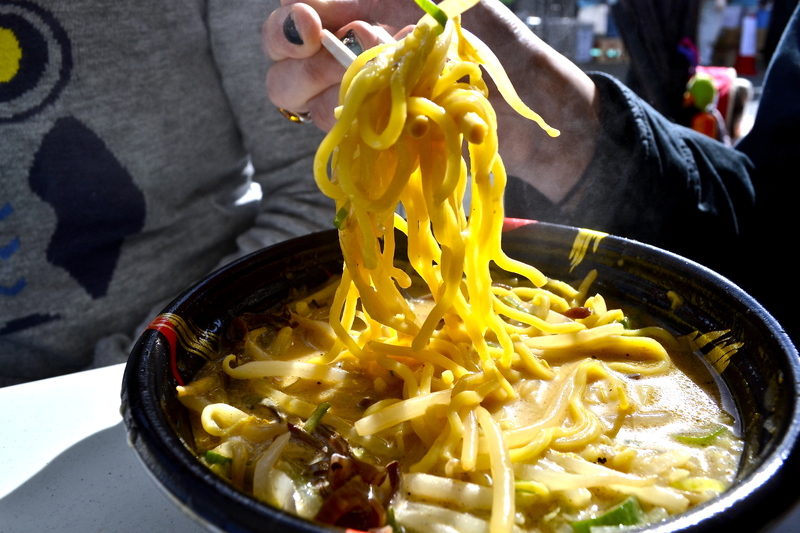 Gogyo restaurant serves burnt ramen just off of the Nishiki market in Kyoto. I don’t usually put the word “burnt” in front of food and expect positive results. I was a little skeptical the first time I went, but I thought hey, “I’m sure everyone eats it, I might as well try!” Actually as it turns out, no one eats burnt ramen and all my co-workers gave me dubious looks when I told them about it. So this restaurant is a little experimental, but for good reason because this ramen is amazing! 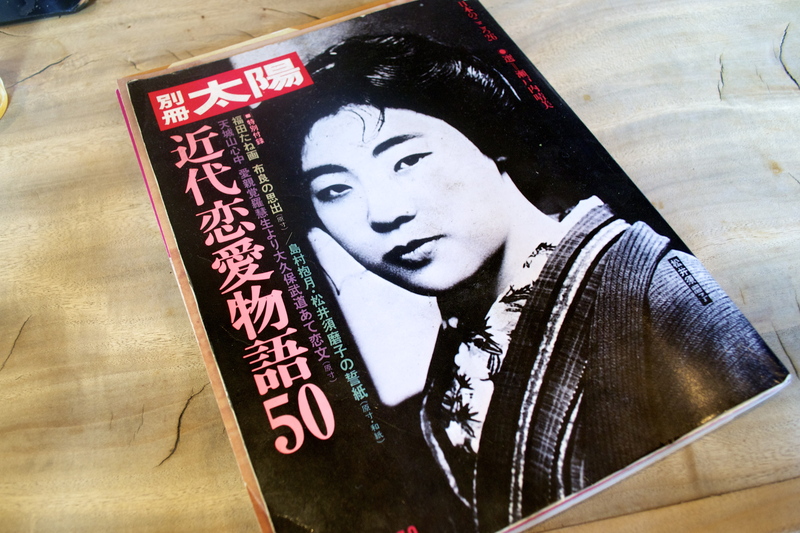 I liked it so much I’ve gone back every time I’m in Kyoto. The broth is cooked to 300 degrees which gives it an earthy smokey taste. I’ve had both the Soy (Shoyu) and Miso Ramen. The Soy Ramen broth was a little clearer and more salty and the Miso brother more dense and smokey. Both are pretty oily and the portions are big so it’s best to go when you’re really hungry and you have a leisurely evening planned. 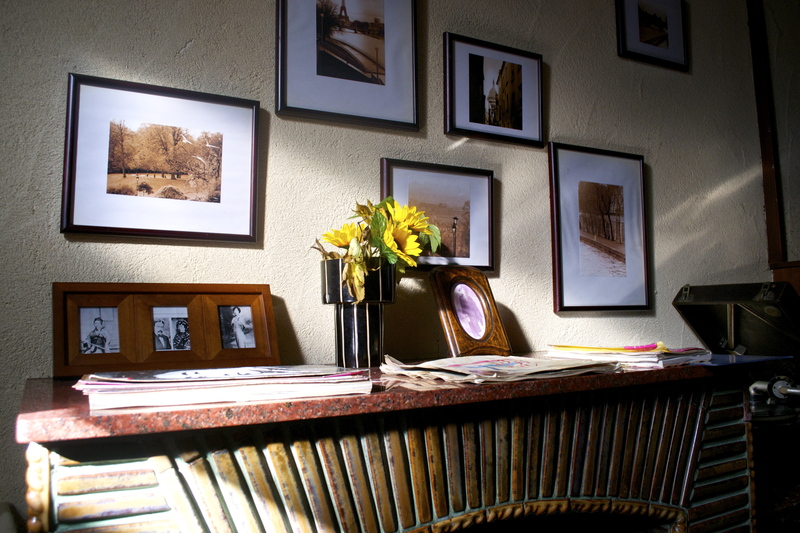 The restaurant itself is gorgeous, with dark wooden furniture and a dimly lit atmosphere that feels both elegant and cozy. 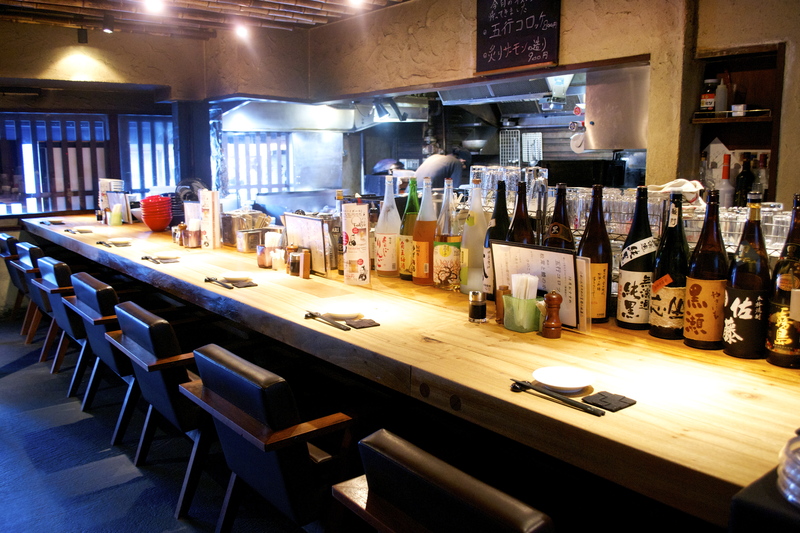 The restaurant has now opened locations in Tokyo and Nagoya! 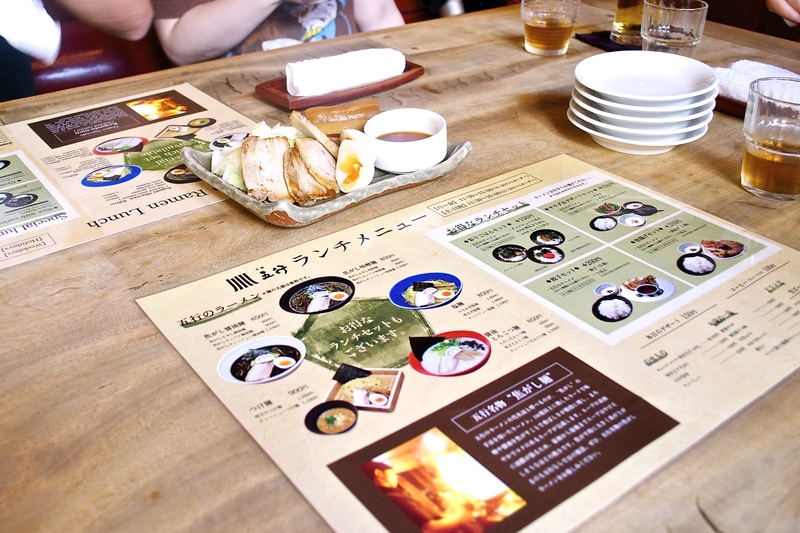 Check out all their information and menus on their website! Location near the Nishiki Market in Kyoto. 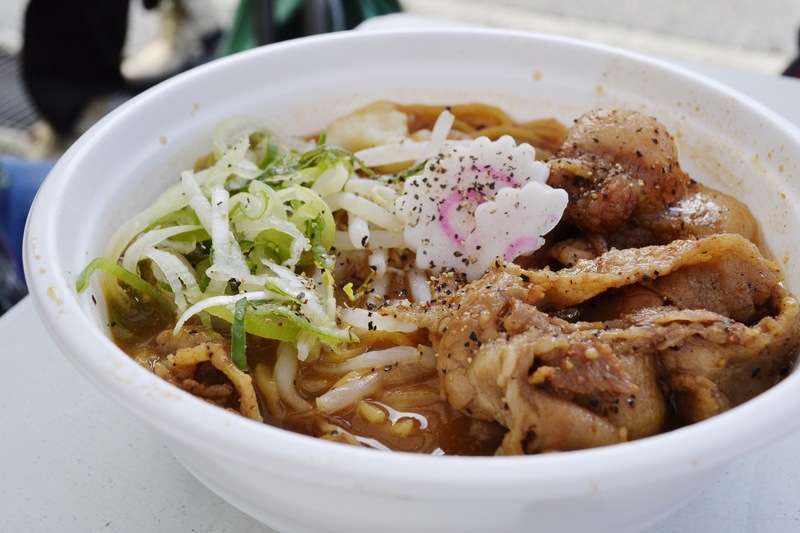 Yesterday I took the train to the town of Nyuzen, in the East of Toyama Prefecture for “The 14th Nyuzen Ramen Matsuri 2014”. It was the perfect day for a food festival, with the already not-so-cold winter feeling like it was coming to a definite close. 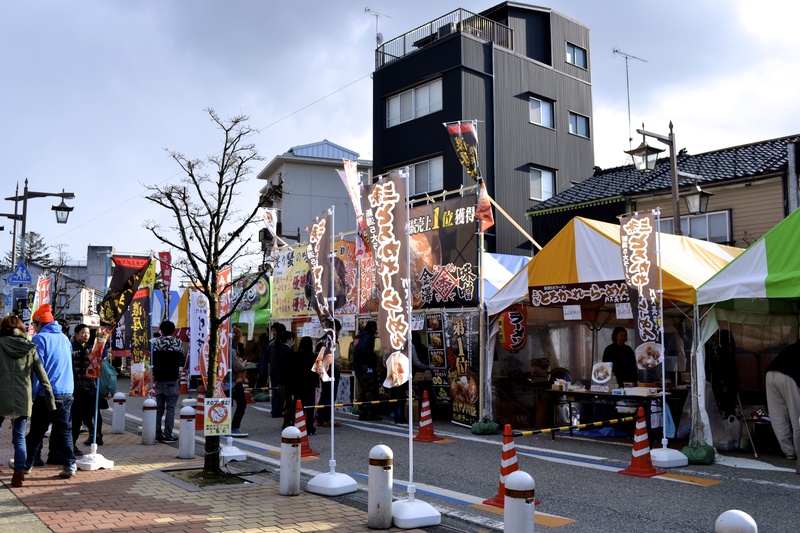 The main street was lined with Ramen vendors from different areas of Japan (although many were from Toyama prefecture) averaging around 800 Yen a bowl. 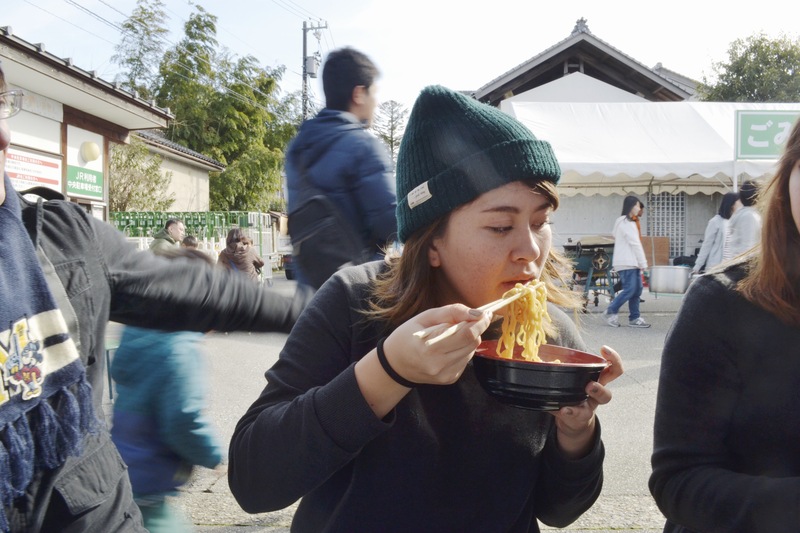 Ramen sounds pretty straightforward in theory, but this festival was evidence enough just how much variation is possible. My first was a miso ramen from Ishikawa, and it was super oily and a little spicy- amazing! My second was a Soy Ramen from Hokkaido which was a little lighter and more sweet. 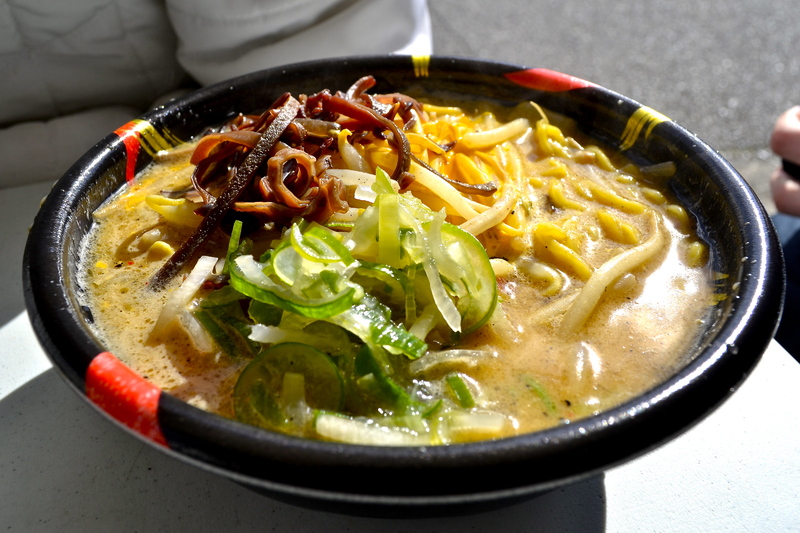 Miso Ramen from Ishikawa Prefecture – Smokey and Oily, my favourite one! 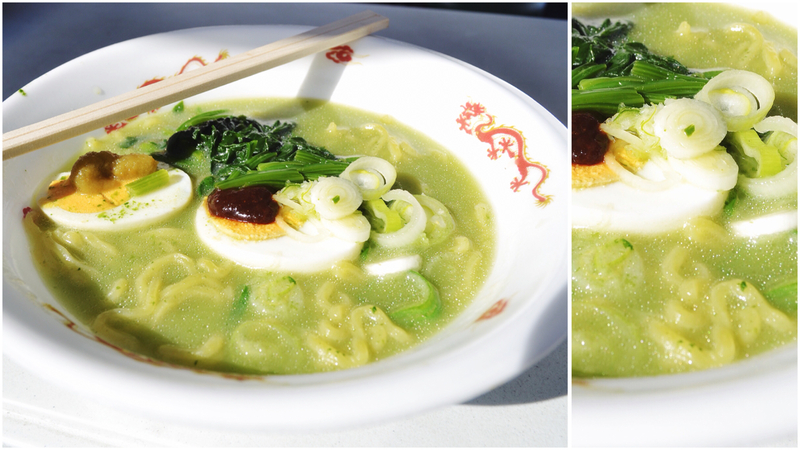 Spinach Ramen – perhaps the “healthiest” of all the options! Soy Ramen from Hokkaido! Clear and a little sweet. I managed just over one and a half bowls all together (with plenty of taste-tests from my friend’s picks), which left me in a slight food coma for the rest of the day. It was a great way to spend an afternoon, you really can’t go wrong with good food, weather, and company. They also happened to play pretty great music, including some Barry White which was an excellent soundtrack for noodle slurping. 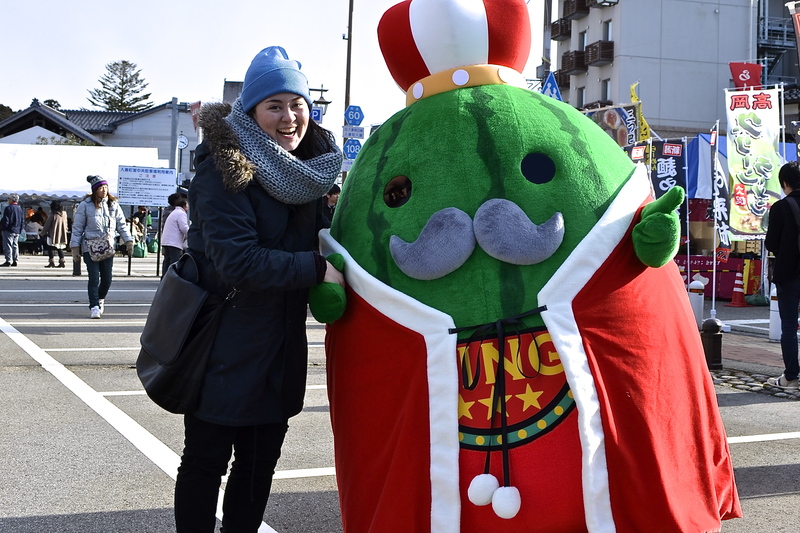 We also ran into the official Nyuzen mascot- a giant watermelon! 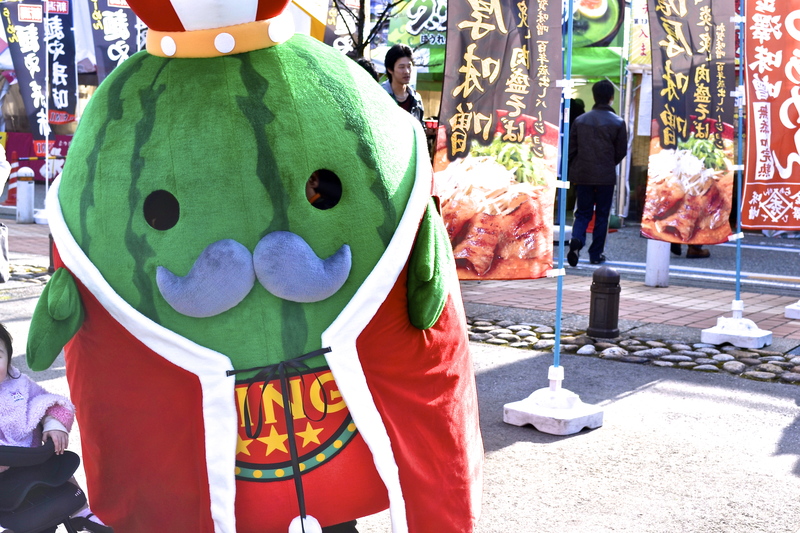 Or, watermelon King to be precise.